Oh he’s crazy all right, just not in a bad way. He’s Crazy Marvin and he’s just crazy enough to make you laugh and show you a good time. He plays the harmonica, sings, cracks jokes, lets loose a wild, cackling laugh that would make a hyena blush. It’s not hard to find Marvin. He’s either playing with his own band, the Blues Express, or sitting in at a local jam. It’s not hard to get Marvin to get up and play, it’s what he loves to do. It’s probably harder to get him to stop. Marvin Braxton, was born on MAY 30, 1943. His dad, Charles Braxton was a supervisor for the city, who also played boogie woogie piano, ran an occasional after-hours spot, and, according to Marvin, cooked up a terrific batch of home-brew every so often. Marvin’s mother, Laura, confined her piano playing to the church. Marvin grew up in the Miles Park section of South-East Cleveland. Miles Park, once known as Miles Heights, had been a separate community with a mostly African-American population that, in 1929, elected the first Black mayor in Ohio. Marvin had another name for his neighborhood. Marvin attended Beehive Elementary school and then Nathan Hale Jr. High, but never went on to high school. He didn’t want to go to school; he wanted to work. And he wanted to work with horses. He started at Thistledown Racetrack, now in North Randall, then moved on to Cranwood and Northfield Park racetracks. He kept on moving. Marvin was, in the parlance of the Racetrack world, a Hot Walker. The primary job of a hot walker is to walk the horses on a lead after races or training sessions to cool them down. Though there are mechanical devices that can do this, a good hot walker can make a difference by helping to spot problems, and a good hot walker will know how and when to vary the horse’s cooldown speed and walking direction. The hot walker is also usually responsible for cleaning and grooming the horses after racing or training sessions. A good hot walker can get work at any racetrack. They usually stay at one track for the length of the racing season, then move on to another track for the season at that track. Tracing Marvin’s musical career isn’t easy. He moved constantly, following the different race track seasons around the country, but he generally marks the beginning of his music career at Cleveland’s Leo’s Casino, where he won a contest. The prize was $100, which he didn’t get, but the contest did result in his going to New York City, where all kinds of things began to happen for him. He won the amateur talent night contest at the Apollo twice, and got himself a job delivering the internal mail at the CBS building. At that time Marvin was calling himself “Little Jimmy Reed” or just “harmonica”, and was hanging around with a lot of very famous, very important musicians. One of these was the legendary Sylvester, “Sly” Stone, of Sly and the Family Stone. In late 1969, Sly and his manager David Kapralik, talked A&M records into letting Sly have his own record label, Stone Flower. The idea was that Sly would produce the records and play all of the instruments on them, while promoting new vocal talent, who’s names would be on the record. Stone Flower’s first two releases were by the group “Little Sister” which did indeed include Sly’s younger sister Vaetta, or “Vet” as she was usually called. Their first record, “I’m The One” Parts one and two reached as high as number 22 on the charts. The next group to record was called 6IX and included Marvin Braxton on vocals and harmonica. With 6IX Marvin opened shows for Sly and the Family Stone and often performed as backup band for Little Sister. They say you should hitch your wagon to a star, and Sly Stone certainly was a star. But he went nova very quickly and soon burned out. Fortunately, Marvin a lot of other very important friends. One of those friends was Jimi Hendrix. On September 25, 1969, Jimi invited Marvin to record two songs with him at the Record Plant on 44th street in New York. The recorded “Drinking Wine, Sipping Time” and “Villanova Junction”. The songs were never released commercially, but are occasionally found one of the hundreds of Hendrix bootlegs that pop up periodically. For a while Marvin lived in in Greenwhich Village’s legendary Chelsea hotel. Marvin’s next move was West. 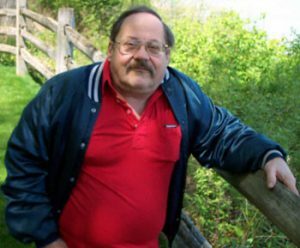 Eventually, Marvin decided that his traveling days were through and he returned to Cleveland where he met and married his first and only wife, Rita, settling in with her and her large family in their house in Glenville. Marriage induced Marvin to change at least some of his ways. He joined the band Dave and the Blues Express. After Dave’s death the band became Crazy Marvin and the Blues Express, and some of those musicians are still in the band today. Marvin never meant to give up traveling completely. His harmonica and his blues have taken him overseas twice. At age 70, Crazy Marvin may have slowed down just a bit, but he hasn’t completely forgone insanity. He’s dropped a few of the more outlandish costumes but still enjoys showing off his collection of wild hats. And he still plays the blues. Collinwood, on the East side of Cleveland, OH is, and has always been a tough and solid working class neighborhood. Built around the huge New York Central rail yard, Collinwood grew and then declined along with the railroad. The 1940’s were a boom time for the railroad, and for Collinwood. It was there and then that two remarkable musicians were born and grew up: Glenn and Gene Schwartz. Glenn & The two brothers grew up in the blue-collar heart of a Cleveland that was itself the heart of American industry. Glenn & Gene’s dad worked at Republic Steel, their mom in an office of a business forms company. At an early age, Glenn’s parents recognized that he had interests that were something outside of the close knit Collinwood world. At age 10 in 1950, Glenn’s dad bought him a new guitar, a good one, a Gibson ES-125, and lessons to go along with it. At age 11 he was good enough to enter a music contest at Baldwin-Wallace college. Glenn won first prize with a nearly perfect score. Growing up in Collinwood in the 1950s, Glenn stood out for his abilities as an artist, a musician and as a drag racer. Glenn played in polka bands, rock & roll bands, wedding bands, and blues bands, constantly and obsessively practicing his instrument, honing his craft. Playing with the Pilgrims he wore a wig. At that time long hair didn’t go over very well in Collinwood. Glenn trained as a medic, and was shipped to Germany. Army service in Germany was a lot different for a medic than service in Vietnam would have been. There were no casualties. So Glenn started playing in bands. After his discharge in 1966 Glenn returned to Cleveland. His playing had reached a high level. He began playing with the Mr. Stress Blues band. He was also playing with the first version of the James Gang. In 1967 he got a call from his friend Dewey Dorrow, urging him to come out to California. With Pacific Gas & Electric, soon to known more simply as PG&E, Glenn quickly began to develop a reputation. He was hot, admirers included Jimi Hendrix, and even Duane & Gregg Allman, who offered Glenn a position in the Allman Brothers band before the job was offered to Dickie Betts. Glenn’s star rose even higher when PG&E’s recording of Are You Ready, began to climb up the charts. Glenn had embraced the 1960’s Rock & Roll lifestyle with everything that went with it. But he wasn’t happy. By June of 1968, despite all his success and renown for his guitar playing, Glenn wanted something more. He wanted to change. On a warm June evening he took a walk down Sunset Avenue that would change his life forever. Glenn stayed in PG&E for another two years, but his newfound religion had changed his relationship with the rest of the band. In 1970 he returned to Cleveland. Shortly after his return to Cleveland, Glenn put together the first Schwartz Brothers band, and had a weekly gig at Faragher’s Back room in Cleveland Heights. Glenn’s backsliding began to bother him. He did six months in the workhouse for spousal abuse. Larry Hill convinced Glenn to move to a Christian commune near Orwell, OH where Glenn became the lead guitarist in the All Saved Freaks band, the outreach arm of the farm’s ministry. Glenn stayed at the farm for seven years, recording four albums and touring throughout the country. As the Reverend Hill’s hold over the group became stronger and the group became more cult-like, Bill and Ann, Glenn’s parents became more and more concerned. They arranged with Ted Patrick, the noted deprogrammer, to have Glenn kidnapped…and deprogrammed. It didn’t work. Glenn returned to the farm where he recorded “Brainwashed” an album filled with furious guitar playing and songs telling the story of his experience with Patrick. In 1978 or ’79, he’s not sure which, Glenn finally left the farm and returned to the family home in Euclid where he and Gene live today. Despite periods of what he calls “backsliding”Glenn has fought to remain true to his faith while continuing with his first passion: guitar playing. In the early 1990’s Glenn & Gene began a series of Thursday night shows at Major Hooples, a nightclub in Cleveland’s flats area. Glenn & Gene’s fans regularly packed the house to hear Glenn’s firey playing and even firier preaching. Today, in their seventies, the Brothers continue to play with a fire and energy that would be impressive for musicians 50 years younger. Now, with an added monthly gig at Collinwood’s Beachland Ballroom, there’s no sign of that fire going out. While Glenn was charting his own difficult course through music and life, younger brother Gene was forging his own unique and remarkable career. Born three years after Glenn, Gene, like Glenn, grew up in the Collinwood neighborhood of Cleveland, attended Nottingham Elementary, then Collinwood High for a short while until the family moved to Euclid, OH in 1958. Not liking Euclid High very much Gene left school in the 11th grade. What Gene liked was cars. He liked working on them, painting them, fixing them, modifying them, driving them, and most of all: racing them, more specifically drag racing. He took a job at Keith Weigel Motors working in the body shop, and stayed there until the dealership closed twelve years later. Currently, Gene owns four cars, all of which are extensively modified; a 1967 Chrysler, a 1962 E-Gasser, A Fleetline Chevy Fastback, and his primary racing vehicle, the 1952 Chevy 2 door hard top, bought new by his dad Bill, in 1952, and given to Gene when he was 15. It is the ’52 Chevy that Gene drives and races to this day and with which he held the NHRA record between 1964 and 1967. He also held the NASCAR Street Eliminator record in 1965. But we’re interested in Gene as a bass player, a musician, and just how that came to happen. It was Dave Griggs who convinced blues legend Robert Lockwood to start playing again. In 1970 Lockwood began appearing with the Dave Griggs Blues band, but soon looked to put his own band together. Gene and Robert became so close, as musicians and as friends, that Robert didn’t want to perform unless Gene was there. Together, sometimes as a duo, and sometimes with the rest of the Lockwood band, Gene and Robert played everywhere. Oh, and at every performance, Gene wears one of the Amish style flat-brimmed hats he first bought out in Middlefield, OH. In November of 2006, at the age of 91, Robert Lockwood, Jr suffered a cerebral aneurysm and a stroke and passed away shorty afterward. Since then, Gene has mostly limited his playing to his performances with Glenn. Travis “Moonchild” Haddix was born November 26, 1938 in Hatchie Bottom, Missisippi to a family of sharecroppers. When he was 9, his family moved to Walnut, Mississippi, a “big city with a bank, a post office, a Western Auto store, and a cotton gin.” Travis was taught guitar by his father, Chalmus “Rooster” Haddix, a Delta Blues style player. Travis was also inspired by B.B. King as a youth. He attended the local “colored” high school in Walnut, where he starred in basketball. The Haddix household was ten strong, with five boys and five girls. All the boys were musicians. Travis graduated high school in 1957, and his family moved to Milwaukee a year later, where Travis played in several bands, including one with his brother Al, who for a while played with Brother Jack Mcduff. Travis attended Marquette College in Racine,Wisconsin, where he again played basketball. He finished his degree years later at Cuyahoga Community College. He was drafted into the Army in 1961, and became a missile track radar operator stationed at Fort Knox, Kentucky, Fort Bliss, Texas, and Pforthiem, Germany. Playing in the service club at Pforthiem helped Travis avoid guard and KP duty. Travis was discharged from the service in 1963, and came to Cleveland, where he took a job at Severance Shopping Center as an electrician. He played with the band Chuck and the Tremblers at several clubs on Euclid Avenue, including Tito’s, The Red Carpet Lounge, The Music Box, and the Birdland Ballroom. He also played with Ernest and DL Rocco, and occasionally sat in with Eddie Baccus and Duke Jenkins. Travis started his own band, The Now Sound, in the late ’70s, but in 1985 his band bolted for a chance to play with Johnny Taylor. The nickname “Moonchild” stuck after Travis recorded a song of the same name. The Travis Haddix Band followed, and included Marvin Young, Eli Thomas, Scanlon “Scatman” Sharp, Tyrone Pierce, and the late Frank “Silk” Smith. They appeared often at the Plush Entertainment Center on Miles Avenue, and opened for many touring acts: Clarence Carter, Artie “Blues Boy” White, Johnny Taylor, Bobby Blue Bland, Latimore, Denise LaSalle, Joe Simon, Tyrone Davis and Little Milton. The band’s first recording for Ichiban Records, “Wrong Side Out”, was released in 1988. They did five albums for Ichiban, some with Gary “BB” Coleman. It was around this time that Travis’ songs began to get noticed by other artists such as Jimmy Dawkins, Son Seals, and Michael Burks. “Begging Business”, “Bag Lady”, and “Everything is Everything” are among his songs that have been recorded by others. “Everything is Everything” is featured in the film April’s Fool. In 1989 Travis started Wann-Sonn Records, named for his daughters Wanda and Sonya, and he made fourteen records for his label. In 1990 Travis started touring in Europe, and he has played clubs, concerts, and festivals in 22 different countries while keeping Cleveland as his home base. 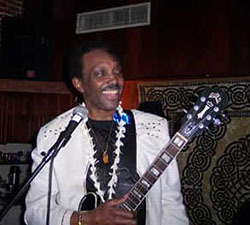 His recordings and performances have received glowing reviews in publications such as Living Blues Magazine and Big City Blues, and he has been honored with numerous awards: Best Male Blues Artist, Best New Blues Artist, and in 2007 he won the Gay Rose Productions Keeping the Blues Alive Award. With insightful and sometimes humorous lyrics, and a horn-driven sound reminiscent of the Stax-Volt era, Travis Haddix remains a powerful force in the blues, and he is a true Cleveland musical icon. Screamin’ Jay Hawkins was one of the most flamboyant and influential entertainers in the history of American pop culture. He was born Jalacy Hawkins in Cleveland on July 18, 1929, and placed in an orphanage until adopted at the age of 18 months. Jalacy learned classical piano as a youth, but dreamed of singing opera like his idol Paul Robeson. Opera didn’t work out for Jalacy, but it was a permanent influence on his stage persona. Hawkins was also a boxer, and fought in Gold Gloves competitions before quitting high school to join the Army Air Force. He served in World War II primarily as an entertainer based in the Pacific Theater, but played service clubs around the world. He claimed to have been captured (and tortured) as a POW before he was able to engineer a chaotic and daring escape. He had a brief career as a professional boxer before he focused on starting a career as a blues piano player and singer. Jalacy Hawkins once said he got his nickname at a nightclub in Nitro, West Virginia, in 1950, from a fan who encouraged him to “Scream, baby, scream!”. In the early 1950s Screamin’ Jay worked with artists like Tiny Grimes and Johnny Sparrow before starting his own band. It was at this time that his opera influence surfaced as he began to play in outlandish attire. 1955 was the year that Screamin’ Jay Hawkins recorded his signature song. “I Put a Spell on You” was going to be a ballad, but a rowdy, drunken late-night recording session resulted in a raw performance that featured Hawkins screaming and grunting his way to what was first banned by some radio stations as being “suggestive”, but became Hawkins’ biggest song. He later could not remember the recording session. Disc jockey Alan Freed paid Hawkins to rise from a coffin onstage to perform “Spell”, and Hawkins used the idea to create an act that included leopard skin costumes and various “voodoo” stage props, including skulls and snakes. During the 1950s he also travelled with Alan Freed’s rock ‘n’ roll revues, appeared on “American Bandstand”, and played several Cleveland venues, including Leo’s Casino. Screamin’ Jay’s popularity soared because of “I Put a Spell on You”, but his other recordings did not approach the same level of success. He remained very popular in Europe during the 1960s and 1970s, and appeared in the film American Hot Wax (1978). In 1981, he opened for the Rolling Stones at Madison Square Garden. “I Put a Spell on You” was featured in the movie Stranger Than Paradise (1983), and Screamin’ Jay also appeared in Perdito Durango and A Rage in Harlem. In 1983, he relocated to New York City and worked for a few years with the garage rock band The Fuzztones. They appeared in the 1986 film Joey. In the early 1990s Hawkins had a bit of a recording resurgence which included covers of several Tom Waits songs. His version of “Heart Attack and Vine” was his only British hit, reaching #42 on the U.K. singles chart in 1993. He recorded or toured during the 1990s with Dread Zeppelin, The Clash, and Nick Cave. His 1957 single “Frenzy” was included in the compilation CD “Songs in the Key of X: Music from and Inspired by the X-Files” in 1996. In 1998, he received a Pioneer Award from the Rhythm & Blues Foundation. 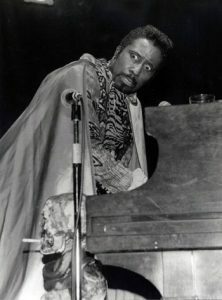 Screamin’ Jay Hawkins died February 12, 2000 at the Ambrose Pave clinic in the Paris suburb of Neuilly-sur-Seine following emergency surgery for an aneurysm. He was 70. His stage persona, with its props and wild costumes, directly influenced artists such as Little Richard, Black Sabbath, Alice Cooper and Marilyn Manson. Nathaniel “Guitar Slim” Savage was born March 2, 1935 in Greenville, Alabama, and began to teach himself guitar at the age of nine. 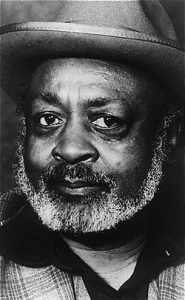 He was inspired by songs like “Big Leg Woman”, “Baby Please Don’t Go”, and “Good Morning Little School Girl”, which he heard on a wind-up gramophone in his mother’s house, and by his grandfather John Wesley Hunter who had a blues band in Detroit. Nathaniel moved to Fort Lauderdale, Florida in 1951, and worked construction when he wasn’t playing music. He moved to Cleveland in 1956, continued to work construction, and played guitar behind artists like Big Maybelle, Sonny Boy Williamson, and Little Milton. Guitar Slim joined harmonica player Tommy O’Neal’s band, then played with Charles Winston’s band. When health problems forced Winston’s retirement from the music business, Guitar Slim started his own band. In 1974, Guitar Slim and his band started playing the Cascade Lounge on Cleveland’s east side, and have been a regular feature there ever since. Their appearances there have been a beacon for musicians like Big Richard, Pete Schmidt, Crazy Marvin, and Robert Lockwood Jr., all of whom have dropped in to share the stage with one of Cleveland’s blues legends. Guitar Slim’s current lineup features Little James on drums, who, like Guitar Slim himself, has been playing since he was nine. 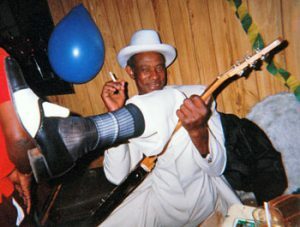 Nathaniel “Guitar Slim” Savage is blessed with eight daughters, one son (Nate Jr.), nineteen grandchildren, 12 great-grandchildren, and secure legacy in Cleveland blues history. Big Maybelle was born Mabel Louise Smith on May 1, 1924 in Jackson, Tennessee. She played piano and sang in gospel choir as a child, but as a teen she embraced rhythm and blues. She took first prize at a Memphis talent show in 1932, and soon after her professional career began, including stints with Dave Clark’s Memphis Band and the all-female International Sweethearts of Rhythm. In the 1940s she joined Christine Chatman’s Orchestra on piano, and in 1944 had her first recording sessions with Chatman. She recorded as a solo artist for the first time in 1947 under the name Mabel Smith for King Records, backed by Oran “Hot Lips” Page. She also sang with Tiny Bradshaw’s band from 1947 to 1950. The decade of the 1950s was the peak of her career. 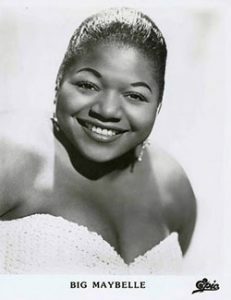 In 1952, producer Fred Mendelsohn signed her to Okeh Records and coined her stage name of “Big Maybelle”. Her first Okeh recording, “Gabbin’ Blues”, hit #3 on the Billboard R&B chart, and the hits “Way Back Home” and “My Country Man” followed in 1953. Her version of “Whole Lotta Shakin’ Goin’ On” was produced by Quincy Jones in 1955, two years before Jerry Lee Lewis recorded it. 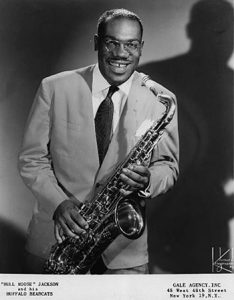 Another hit, “Candy”, came in 1956 for Savoy Records, and was followed by appearances at the Apollo Theatre in New York City and at the 1958 Newport Jazz Festival, which was part of the movie Jazz on a Hot Summer Day (1960). Big Maybelle continued to record into the 1960s, but her popularity and health both declined. Her last hit was in 1967 with her version of “96 Tears”, made famous by the rock band ? and the Mysterians. She moved to Cleveland in 1971 to live with relatives,and died here in 1972. At the time of her death, local DJ Bill Randle (of WERE) described her as “a highly respected blues singer in the Bessie Smith, Big Mama Wakefield tradition.” Her last album, The Last of Big Maybelle, was released posthumously in 1973. 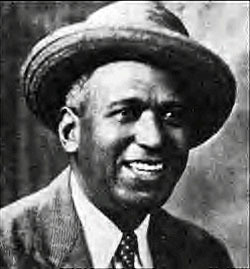 Charles “Cow Cow” Davenport was a pioneer of blues piano. He was born April 26, 1894 in Anniston, Alabama, and began playing piano at age 12. His mother was a church organist, but Charles’ parents frowned on his fascination with ragtime and sent him to the Alabama Theological Seminary, where he was expelled in 1911 for playing ragtime at a church function. Davenport’s career began in the 1920s with Banhoof’s Traveling Carnival, and his early career was mostly in carnivals and vaudeville with TOBA (Theater Owners’ Booking Association). His walking bass lines combined with his ragtime influences helped to create the style known as “barrelhouse” or “boogie-woogie”, a term that Davenport claimed to have invented in 1924. He had his first hit on both piano rolls and 78s with “Cow Cow Boogie”, one of the most popular boogie-woogie piano tunes ever recorded. “Cow Cow Boogie” was written by Benny Carter, Gene de Paul, and Don Raye, and combined two of that era’s fads- the “Western” song and big band/boogie-woogie. The track was written for the Abbot and Costello movie “Ride ‘Em Cowboy”. Later in the 20s, Davenport worked with singers Dora Carr and Ivy Smith, and was a talent scout for Brunswick and Vocalion Records. Throughout the 20s he was based in Birmingham, which was a hub of blues piano activity at the time. He moved to Cleveland in 1930, continued working with TOBA, and recorded with the Gennett label, which was owned by the Starr Piano Company and folded due to the Depression. He suffered a stroke in 1938 which affected his playing, but jazz pianist Art Hodes helped him to remain active as a singer until he recovered enough to play again. A new version of “Cow Cow Boogie” by the Freddie Slack Orchestra, with seventeen-year-old Ella Mae Morse on vocals, sparked a boogie-woogie craze in 1942, and revived interest in Davenport. His attempted comeback, which included appearing on the bill with Duke Ellington at the Masonic Temple on East 36th and Euclid Avenue on January 28, 1950, was hampered by illness, and “Cow Cow” Davenport passed away in Cleveland from heart problems on December 2, 1955. Robert Lockwood Jr. was born in Turkey Scratch, Arkansas on March 27, 1915. He was the godson and musical heir to Robert Johnson, who is considered the greatest of the delta bluesmen.Robert Lockwood Jr.
Lockwood’s recording career began in the 1930s with the Bluebird label in Chicago, but he then returned to Arkansas to start his longtime association with Sonny Boy Williamson II (Rice Miller), and in 1941 the two were featured on the first King Biscuit Time radio show on KFFA in Helena. The rest of the 40s saw Lockwood playing in cities such as Memphis, St. Louis, and Chicago. In 1950, Lockwood settled in Chicago and became a session musician for Chess Records, accompanying artists like Muddy Waters and Howlin’ Wolf. He also recorded as a solo artist for other labels, including Decca. In 1961, Lockwood moved to Cleveland, and during ensuing decades played many area venues, while continuing to record as a solo artist, and these years produced some of his best recorded work. During his final years, he and his band the “All-Stars” were a fixture on Wednesday nights at Fat Fish Blue in Downtown Cleveland. The “All-Stars” still carry on this Wednesday tradition. Robert Lockwood Jr. passed away at the age of 91 on November 21, 2006. Two W.C Handy awards, a National Heritage Fellowship award, one Grammy award, two Grammy nomination, an honorary doctorate (from Case Western Resereve University), an honorary degree (from Cleveland State University), induction into the Blues Foundation Hall of Fame, the Delta Blues Hall of Fame, and now the Cleveland Blues Society Hall of Fame. “Bull Moose” Jackson was a singer and saxophone player prominent in the 1940s and 1950s. He was born Benjamin Clarence Jackson in Cleveland on April 22, 1919, and he was a musical prodigy. He soloed in church choir at age 3, began studying the violin at 4, and had started to play the saxophone by the age of 5. He started his first band, The Harlem Hotshots, while still a student at Central High School, and was soon playing in many Midwest lakeshore communities, becoming especially popular in Buffalo. Ben was recruited in 1943 by bandleader Lucky Millinder, who saw him performing in Cleveland. Jackson began touring with The Lucky Millinder Orchestra, whose members gave him the nickname “Bull Moose”. One night in Texas a scheduled singer failed to show up. Millinder called “Bull Moose” out of the sax section to sing, and “The Moose” was off and running. In 1946, Millinder helped Jackson sign a solo recording deal with Syd Nathan, who was expanding his Cincinnati-based country and western label King Records. Over the next several years, Bull Moose Jackson recorded almost every style of popular music and became King Records’ top artist. He named his new combo the Buffalo Bearcats based on his popularity in that city, and they became one of the top money-grossing acts of the era. Jackson’s first notable effort was “I Know Who Threw the Whiskey in the Well”, a follow-up to the Lucky Millinder song “Who Threw the Whiskey in the Well?”. Bull Moose had his first big hit in 1947 with “I Love You, Yes I Do”, which was a huge national success, and widely accepted as the first R&B single to sell a million copies. It held the #1 spot on the R&B chart for 3 weeks. He had several more hits in 1948 including “All My Love Belongs to You” and “Little Girl Don’t Cry” which helped solidify his reputation as a crooner of ballads. That same year he appeared in the film “Boarding House Blues” with Lucky Millinder. In 1949 He recorded “Why Don’t You Haul Off and Love Me”, considered the first hit country and western song by a black singer. The 1950s brought more shows with the Bearcats and as a solo artist with revues featuring other well-known singers. Jackson’s hit songs, such as “Nosy Joe”, began to show a suggestive, even raunchy streak. One of his lesser-known songs of this period, “Big Ten Inch Record”, has been re-discovered by artists of later eras. Other hits for Jackson in the 50s included “Big Fat Mamas Are Back in Style” and “I Never Loved Anyone but You”. Bull Moose’s star began to fade in the late 50s as popularity shifted to rock ‘n’ roll. By 1964, he had moved to Washington, D.C. and was working for a catering service, then in the 1970s he became a food service administrator for Howard University. During this time his playing dates were primarily private engagements. That changed in 1983 when Carl Grefenstette, leader of a Pittsburgh bar band called The Flashcats, was put in touch with Jackson through a mutual acquaintance. The Flashcats had been playing some of Bull Moose’s songs, and Grefenstette persuaded Jackson to appear with the band. The Moose became an “overnight sensation” in Pittsburgh, playing many sold-out dates. A regional hit “Get Off the Table, Mable- the Two Dollars is for the Beer” was followed by an LP entitled “Moosemania”. The rebirth of Moose’s career led to shows in Los Angeles, at New York’s Carnegie Hall, and a European tour with Johnny Otis. Bill Miller was born on January 1, 1943, and grew up on Cleveland’s east side, where he was exposed to blues, jazz, and rock and roll at an early age, and developed a special interest in the blues. He bought his first harmonica at Jack Epstein’s music store on Prospect Avenue. The first Mr. Stress band debuted in 1966, and by 1968 the band was playing in other cities as well as Cleveland. The band shared the stage with many top rock bands such as Cream. Capitol Records offered the band a contract in 1969 which the band turned down due to the deal’s unfavorable terms. By the 70’s, The Mr. Stress Blues Band had found a home at The Euclid Tavern near Case Western Reserve University. During this decade, Mr. Stress was one of only a few local acts playing blues. The band remained a fixture at The Euclid Tavern for 17 years. The Mr. Stress Band, which featured many of the area’s finest blues talent during its time is no more, but as of the date of this award, Bill is still very active on the Cleveland blues scene as a featured performer with The Alan Greene Band. 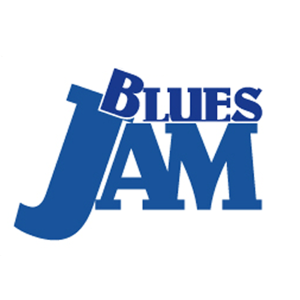 Subscribe here to receive local Blues bands performance dates, times and places. 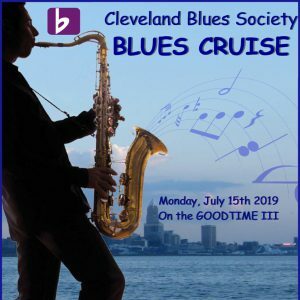 also you will receive alerts to upcoming Cleveland Blues Society Special Events. Our partner venues also oofer specials for members who bring in their card. Stay tuned for those importatn updates as well, and be sure to get your membership to CBS activated/renewed! Contact KD@Clevelandblues.org with any questions.